Location: About 150 m from junction with Albany Road, backing onto railway line. Built as a Calvinistic Methodist Chapel in 1899, by J.H. Phillips, architect. After closure, the chapel became an Islamic Cultural Centre in 1985. Former Chapel in an eclectic Art-Nouveau style; on basement hall (ground falls steeply behind entrance). Of Pennant stone with Bath stone and yellow brick dressings, and slate roof. An elaborate shaped gable has ball-finials and oculus near the apex. A large arched window has shaped radial keystones. On each side of the front is a D-plan stair turret with a concave pavilion roof and iron ball finial, the upper level faced in Bath stone with 7 round-headed windows, and 3 stepped windows below. Between the turrets the slate roof sweeps down over the porch with very broad 3-centred arch. The camber-headed entrance doorway is flanked by small windows. To each side, at right angles, are doorways to the stair turrets. Stub walls to the porch carry iron railings. In front of the chapel, attached by low walls is a forecourt wall in Pennant stone and Bath stone, iron railings and gates. The chapel is reached via a stone bridge over the basement area. The 5-bay side elevations have shallow brick buttresses, round-arched windows to the upper level, and camber-headed headed windows to the ground floor. The basement is brick with camber-headed windows. Listed for architectural interest as striking and original chapel design retaining considerable historic character. On the N side of the junction of Woodville Road and Flora Street. On the corner of Plasnewydd Square and Keppoch Street. In its own grounds in Plasnewydd Square. At the junction of Albany Road and Wellfield Road. On the E side of the Primary School. The school faces directly on to Penywain Road, with flanking playground walls with gateways. 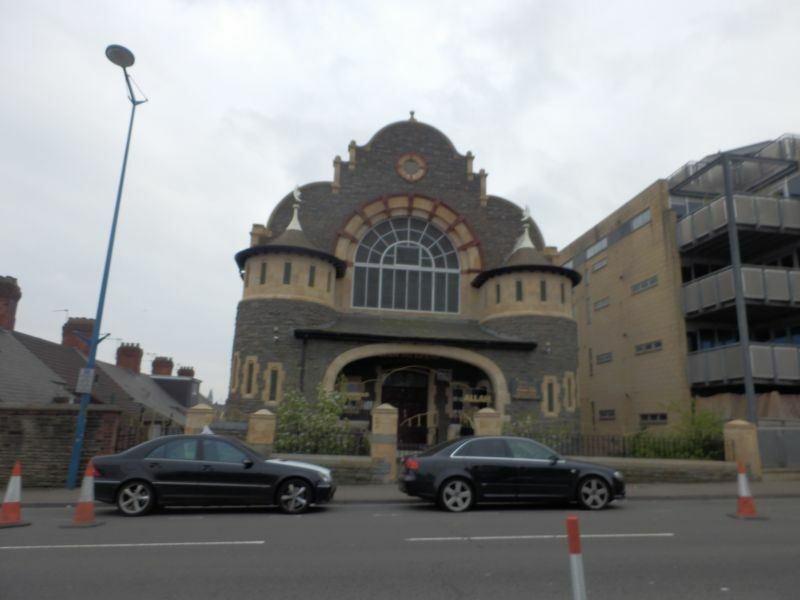 Situated at corner of Pen-y-wain Road and Morlais Street in a prominent position at top of hill.